What makes Hill & Markes sustainability program so special? First of all, Hill & Markes walks the walk. We have invested in our own state of the art LEED Certified facility. We care deeply about the future of our planet. Secondly, we have always made it a priority to have the most sustainable products in the industry and partner with the most sustainable-focused manufacturers in the industry. We supply dozens of Green Seal Certified, FSC, DFE paper and chemical products. Our partnership with Cascades Tissue Group is proof of our commitment to sustainability. Cascades provides locally produced and delivered products (reducing fuel usage) and has invested in manufacturing facilities that utilize solar and wind power. Third, we partner with companies like Tennant and Ecologic to offer you chemical-free cleaning. Now we can offer you sustainable products you can be confident won?t hurt our environment when they go down the drain. 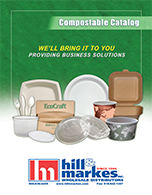 Finally, we have made a major investment in a vast inventory of compostable food service disposables that helps reduce the landfill burden. We are here to make an impact in every way we can. 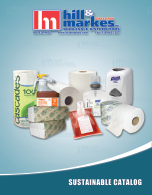 Check out our Catalogs for great products! Call 1-800-836-4455 or let us call you!